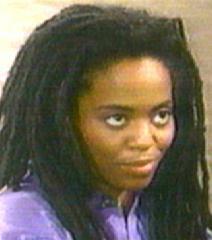 Portrayer: Rhonda Ross Kendrick, March 19, 1997 - June 25, 1999. Exit Scene: On Vicky and Jake's front lawn, "Night, Jake." Lovers: Chris Madison (fiance) (1997-1999). Medical History: Raped by Chip Rayburn (1997).